The Orbea Oiz was designed from the ground up to be as capable and efficient as possible. Originally built around the 26” wheel platform, the Oiz has adapted Orbea’s BWC (Big Wheel Concept) by offering 27.5” (650b) models in size small. This method considers the rider’s height and riding style when sizing the bike - avoiding improperly sizing a bike in an attempt to compensate for an ill-matched wheel size. At the heart of the Orbea Oiz is the Advanced Dynamics development process - a simulation program that allows the engineers to meticulously study how the frame and suspension will perform depending on rider size and exerted forces. This virtual testing ground allows Orbea is finely tune their frame geometry and suspension platform before ever creating a single prototype bike. The Oiz’s XC geometry was devised for going fast, providing the proper head tube angle to allow for precise steering through technical terrain while also remaining stable after picking up speed. Additionally, the seat tube angle is strategically positioned to provide the best leverage when climbing steep and rugged terrain. As the whole point of suspension on a mountain bike is to absorb the rough stuff and keep your wheels in contact with the ground, the Adavanced Dynamics Technology not only relieves the rider of forces exerted by the trail, but also provides better traction and control through technical and bumpy terrain. In an effort to reduce friction and increase efficiency, the Oiz uses Sealed Ball Bearings rather than bushings. This, along with the optimized leverage curve provided by the Diamond Link, allows the suspension system to provide excellent pedaling efficiency and small bump compliance. 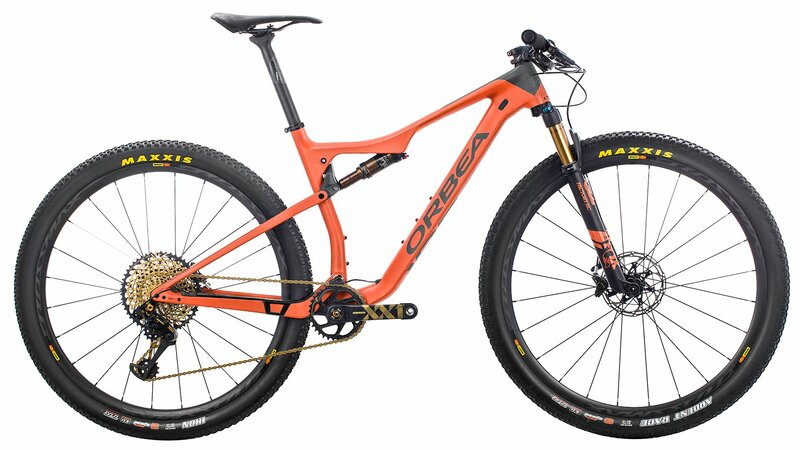 To further improve the overall suspension performance, Orbea includes a bearing at the rear shock mount, which is partly what sets Obrea suspension system apart from the rest - allowing the suspension to move freely while keeping the bike stiff and without adding unnecessary weight. The Oiz M-LTD represents the pinnacle of the Oiz lineup. It features a host of components that are intended to help you in your pursuit for the podium. The SRAM XX1 Eagle drivetrain sports a huge gear range that allows you to tackle the steepest climbs, charge the flat sections, and mash the downhills. Carbon Mavic wheels are not only lightweight, but also demonstrate a level of durability that is made to withstand the rigors of cross country racing. The Fox Factory StepCast fork features 100mm of travel that makes easy work of trail chatter while also sucking up some of the larger hits. When it comes time to slow things down, SRAM Ultimate Carbon brakes get the job done with confidence in all conditions. Top it off with FSA’s K-Force cockpit and you have pure race machine that is ready to take you to the next level. OMR carbon fiber frame is built for racing. 29” wheels maintains speed and easily rolls over obstacles. Fox Factory fork with 100mm of travel. Mavic Crossmax carbon wheels are made for speed. FSA K-Force cockpit with full carbon construction.